The SP-280 provides a playing feel that&apos;s incredibly close to that of an acoustic piano by switching between four piano samples according to the dynamics of your performance. From delicate pianissimo to dynamic fortissimo, the sound will respond realistically to how you play. In particular, the "Grand Piano" sound reproduces the damper resonance that is heard when you press the damper pedal of an acoustic piano, heightening your experience of the overall piano sound and making it even more enjoyable to play. Special attention has been paid to the high-quality electric piano sounds, which are period-accurate and highly satisfying. 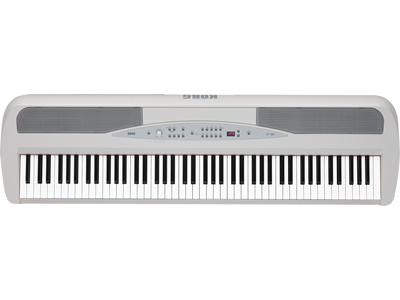 The standard electric piano sounds reproduce not only the way in which the tone responds to your touch, but also the subtle noises that occur when you release a key. Six varieties are provided, covering the sounds widely used in the pop music of the &apos;60s and &apos;70s, as well as the tones valued in soul music. Including the acoustic and electric piano sounds, the SP-280 contains 30 richly expressive and high-quality sounds, including organs, clavs, harpsichord, strings, and more. There&apos;s also a Layer Mode that lets you play two sounds together, and a Partner Mode that divides the keyboard into left and right regions so that two people can play the same range of pitches. Two headphone jacks make it convenient for two people to enjoy playing the SP-280 together. The SP-280 features two onboard amplifiers that deliver 2 x 22 Watts of output power; the highest in its class. Delivering ample richness, deep lows and sparkling highs, the SP-280&apos;s amplifiers make the expressive piano tones sound even better. Since the speakers are capable of producing high volume, they can provide plenty of power for a small live event without requiring a PA system to be connected.